Your spaceship has been seriously damaged. Only one engine is left and you have to use that one booster to guide your ship up and down as you navigate a seemingly infinite tunnel. How far can you go before your ship smashes into the walls and explodes!? Oh, and Lens Flare!!! Released by Tuomas Artman, One Infinite Tunnel is their first app release and it is available as an Universal app for Free! I am reviewing it on an iPhone 3GS. This app supports Openfeint leaderboards. I remember when I was in highschool there was a game involving a helicopter that you had to click to elevate as it navigated through a tunnel. Today, I can’t remember its name, but One Infinite Tunnel is definitely a huge advancement to the entire concept. Tap the screen to use the one booster left on your ship besides the one that is pushing you forward. One wonders why the crew or captain didn’t just have you park the ship so you can repair the other thrusters, but oh well. Their main advertisement actually mentions the lens flare, so let me just comment on that. Yes, it is super cheesy. If you don’t like Michael Bay and his lens flare obsession like in his latest Transformers: Dark of the Moon movie trailer, then this will just make you smile. I do have to admit that it does add a bit of graphical pop to the screen while you travel through the shiny blob-like tunnel. The graphics are actually quite sharp and very crisp. A nice lighting in the structure helps you see some depth in the 2D side scrolling point of view. The unfortunate result of the blob-terrain is how amateurish it looks. This kind of game can make so much more with the environment. 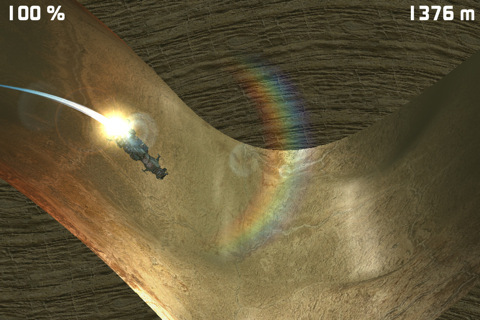 Rocks with crystals, a metal corridor, a twisting, winding worm hole? I’m sure there is more potential than just one stage environment. The basic goal of One Infinite Tunnel is to fly and avoid touching the ceiling and floor. You have a percentage health system and you start with 100% health. As you smashing around, you basically lose about 10% each time. There are health pickups but no other collectables. I would love to see simple shields to defend the next time you smash into the ceiling or some ship shrinking powerup that helps you squeeze through the smaller tunnels. As you progress, once you hit about 6000 ft or so, the screen suddenly zooms out and difficulty picks up heavily. My best distance is a little less than 19000 ft and I always die immediately after I hit that number. On Infinite Tunnel is quite challenging. As it is, the game needs more. More level designs, more powerups, more ship skins, and maybe even more variety in the lens flare… The gameplay is relatively solid and can be learned relatively quickly. I do want to mention that the title screen has some pretty good music by Aleksi Eeben. Despite how simple it is, the music really does add atmosphere and mood before you start playing the game. I appreciate the relatively detailed tutorial before you start the main game. I can recommend this one for anyone. Play it for free and see how far you can go! 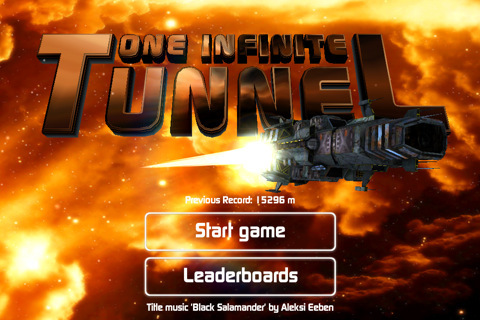 AppSafari review of One Infinite Tunnel was written by Joseph Ho on March 18th, 2011 and categorized under App Store, Games, iPad apps, Physics Based, Universal. Page viewed 4108 times, 1 so far today. Need help on using these apps? Please read the Help Page.